"The Jundland Wastes are not to be traveled lightly." This is based only on the original films and my interpretation of who Luke might become and where he might be after the events of Return of the Jedi. I think he would be drawn back to Tatooine and take up residence in Obi-Wan Kenobi's hut, where he was first introduced to the ways of the force and later built his own lightsaber. He would live alone, much like Yoda on Dagobah and wait for potential Jedi Knights to seek him out. 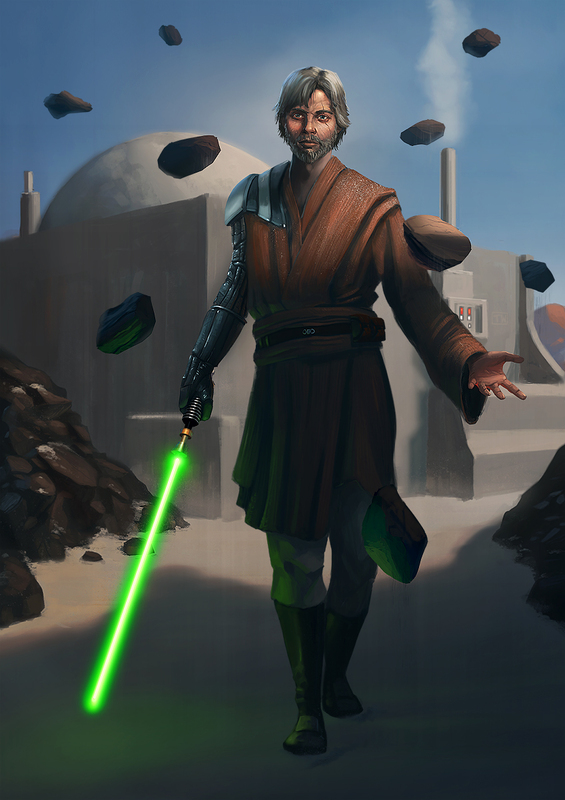 He wears Vader's glove, sleeve and shoulder armor on his right (robotic) hand and arm to honor the man that his father once was and finally became again but also to remind him of the dangers of the dark side.